Manufacturer of a wide range of products which include vinyl sulfone based dyes. Vinyl Sulfone is present as a reactive group in Vinyl Sulfone Based Dyes. These dyes are versatile enough to suit various dyeing methods.These posses optimum performance and precise composition. Our products are manufactured using quality raw material procured from trusted vendors of the country, and advanced technology in accordance with the international standards under the supervision of team of dedicated and highly qualified professionals. Our clients can avail from us customized products as per their requirement.These can be used for printing. 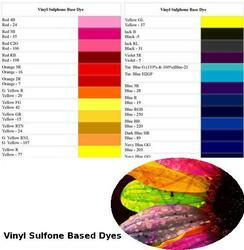 Looking for Vinyl Sulfone Based Dyes ?